I make furniture, sculpture, and paintings. 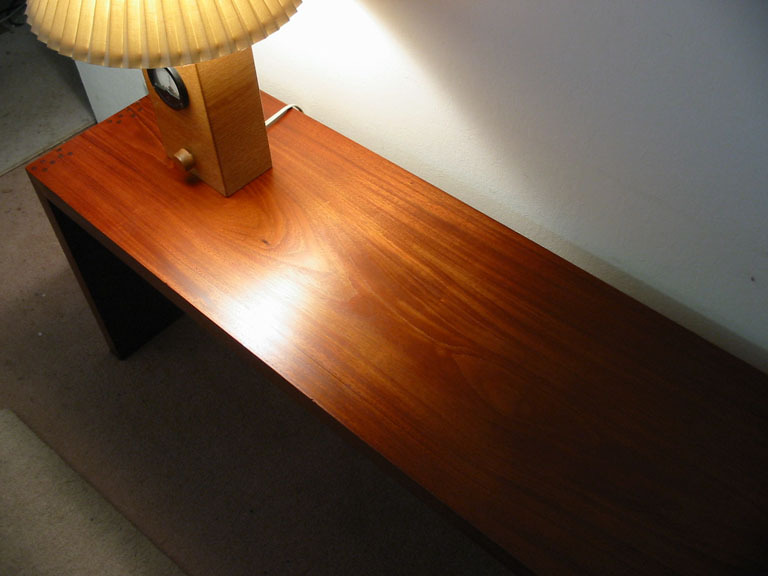 Honduras mahogany. Coffee table or bench, I haven't decided which. I just use it for a hallway table for now. 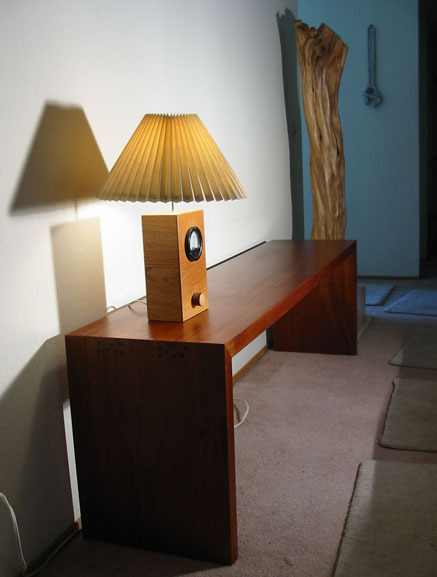 It is made from a single Honduras-mahogany board, cut so its length is exactly my height. Joints are my own design, a random "bullet spray" of black walnut dowels securing a mitered joint. Oiled finish. Red oak, electronic parts. A 1950's-era, analog, alternating-current voltmeter set into a red-oak box. 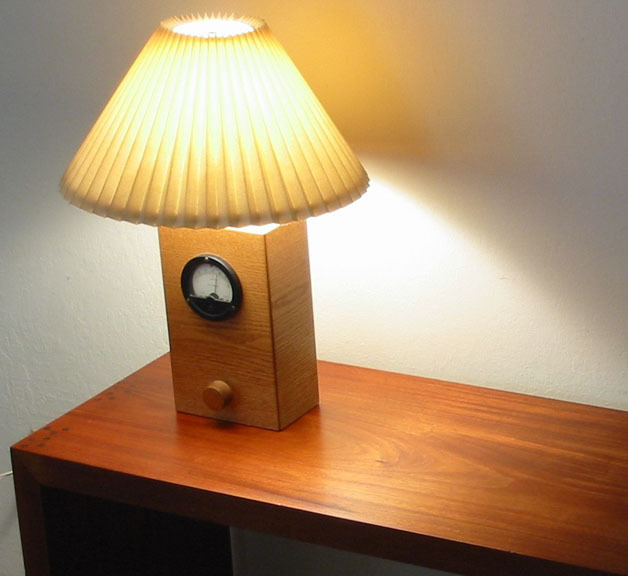 Lamp output is controlled by a rotary dimmer switch. As the light brightens, the voltmeter needle moves clockwise. Wood. The octagon table-top was salvaged from a curb side by a young friend of mine. I removed the original crooked and unsteady wooden-dowel legs and replaced them with longer octagonal legs, to echo the shape of the table top. I affixed the legs with three quarter-octagon braces, each. The wood was nothing special, so I painted the whole in a flat colonial red. Bowing to the wishes of my client, who preferred a girly pink, I sponge-painted the table top in lighter and lighter tints of the same red, to emulate a girly-pink granite. White oak. 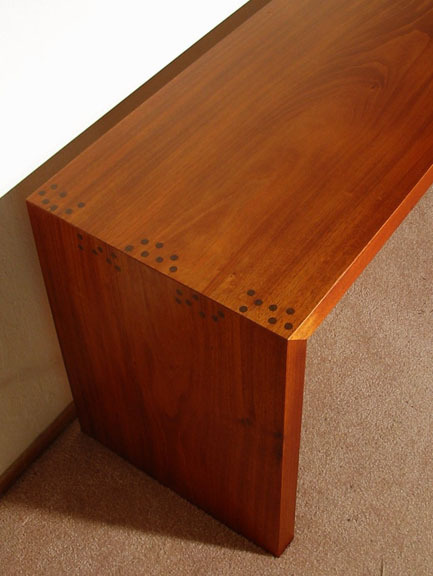 Mahogany inserts in faux finger joints. Oiled finish. Red cedar, concrete with copper and quartz. 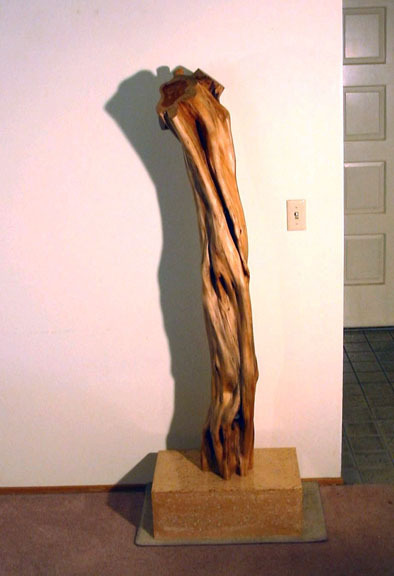 The tree trunk was a salvaged stump of a dead red cedar tree, air dried until the bark fell off. The muscular wood was very smooth under the bark, but I sanded it through 1000-grit sandpaper. It is very smooth, and invites touch, hence the name of the piece. It's like caressing Anna Kournikova. Oiled finish. The base is a Fibonacci brick, approximately 8- by 13- by 21-inches, of poured concrete, slightly hollowed to reduce weight. The concrete is colored buff to echo the color of the wood. Small bits of copper wire are embedded in the concrete surface, and white quartz rocks were used as aggregate. 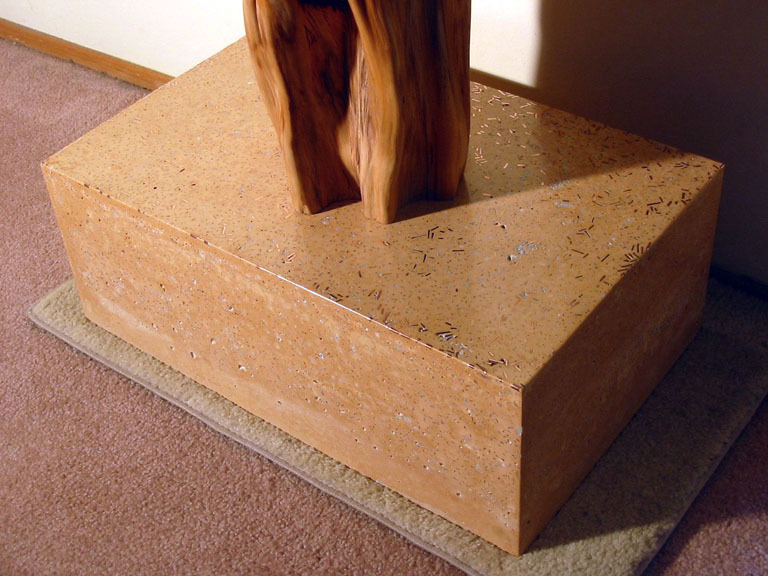 Surface was sanded smooth, revealing copper bits and aggregate, and polished through 6000-grit sandpaper. A wax finish retards oxidizing of the copper. A steel rod is embedded in the top of the concrete and projects into a hole drilled in the bottom of the cedar log, allowing the log to be removed, or rotated for full appreciation. Granite, water. 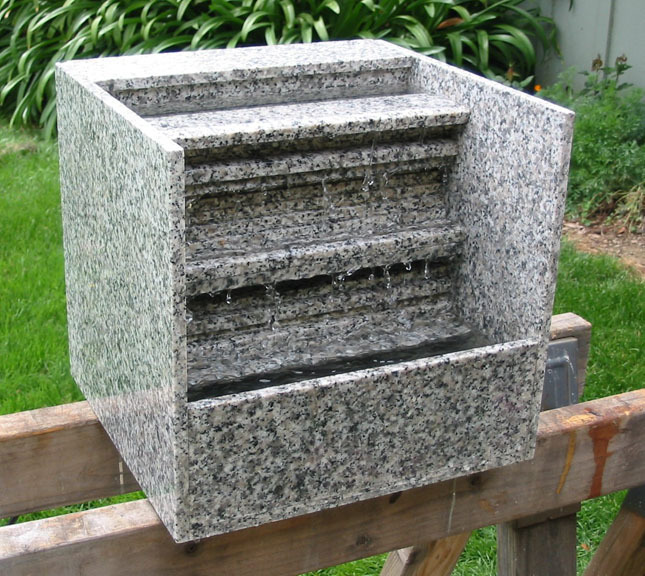 This fountain was designed to be made from one ten-piece package of polished granite tiles. All pieces were created with 21 total straight cuts on a diamond saw. 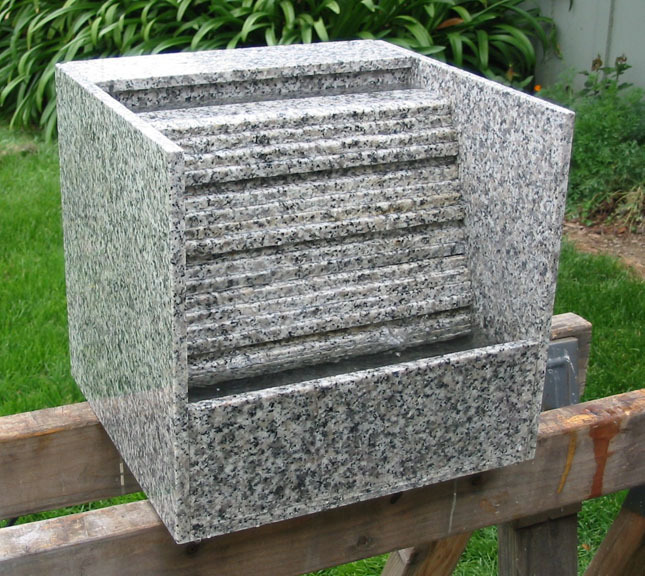 Circulating water flows down over a number of steps, and all but three of the steps are movable, so that the noisiness of the fountain may be adjusted as desired. 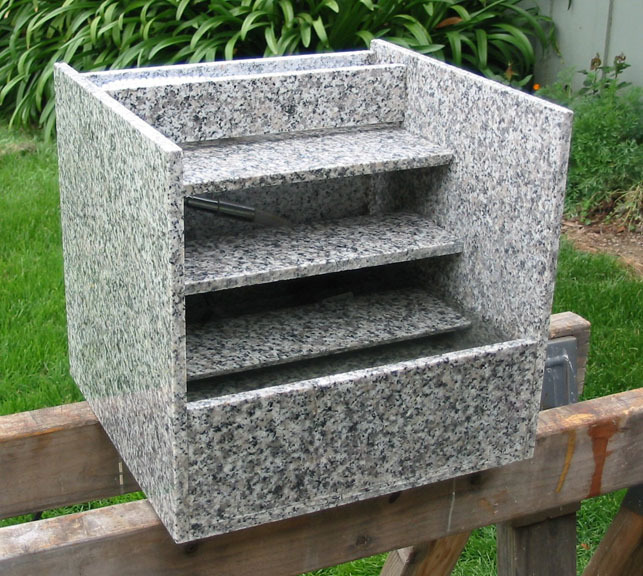 Granite tiles are joined with silicone aquarium glue. It is named after Minnehaha Falls in Minneapolis. Wood and aluminum. 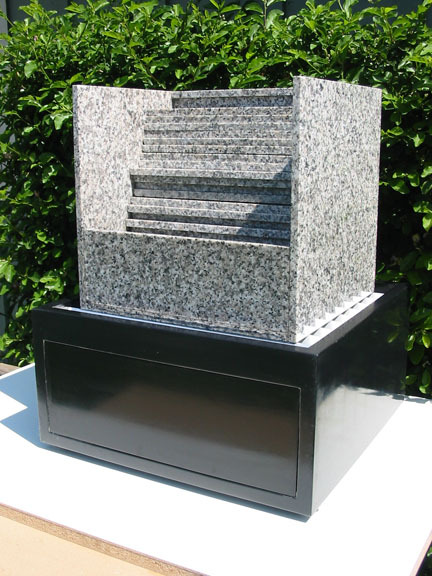 The client requested a stand to elevate the fountain above surrounding plants. I designed a wooden stand that has a plastic-lined drawer that could contain any possible leak. The top of the stand is pieces of aluminum angled stock that form a grillwork that would let any potential leaking water pass below for collection. 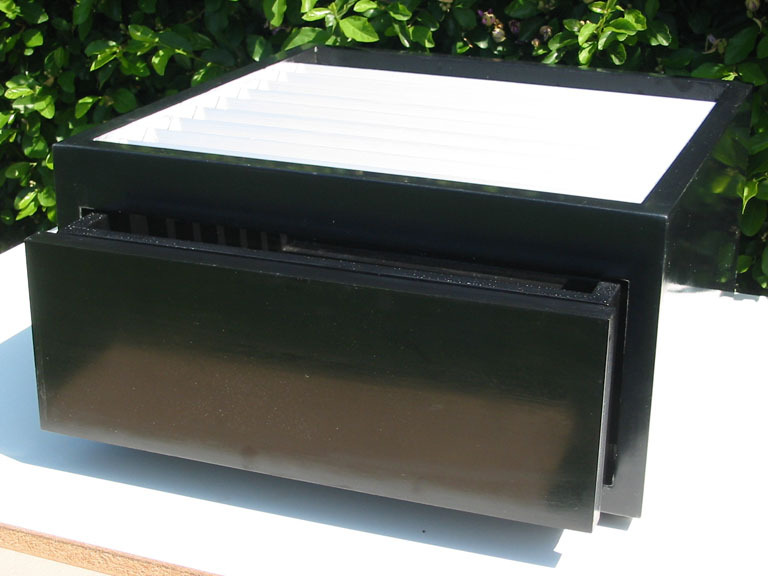 The stand is painted glossy black. 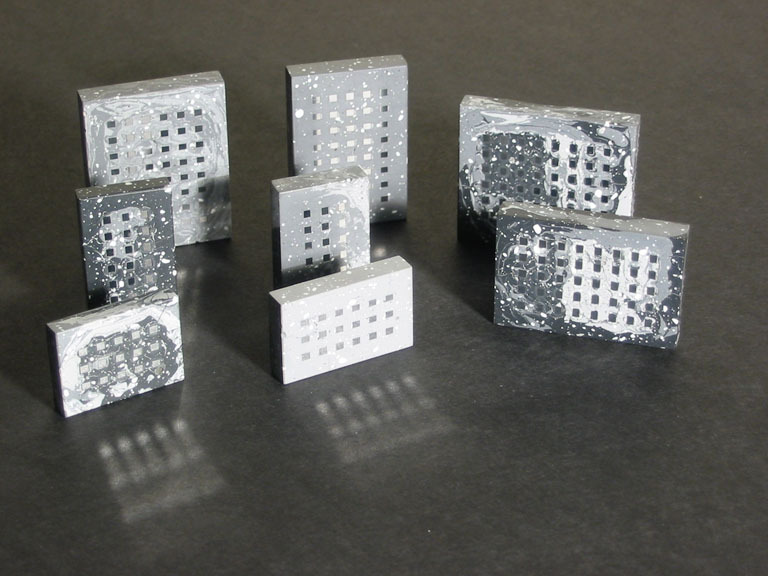 Steel and concrete with taconite pellets. I had two 4-inch steel balls since childhood, destructively extracted from 8-ball paperweights, probably with the same plastic as used for the famous Magic 8-Ball toy. I learned that they were ore-grinding balls, used in great numbers in ball mills to crush large rocks into powder. For instance, such ball mills are used in the Minnesota taconite industry to crush hard iron-bearing rocks into powder, from which the high-iron-content particles can be magnetically separated and formed into taconite pellets, a raw material used in steel making. No doubt a small portion of that steel goes back into making ore grinding balls. To be proper art, they needed some bases to sit upon. 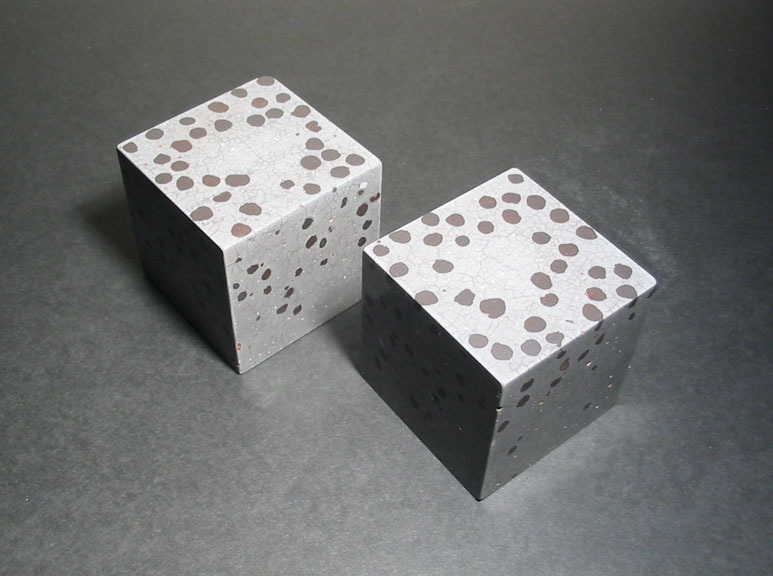 I decided to craft contrasting-shaped cubes of concrete, with dimensions the same as the diameter of the steel balls. As aggregate for the concrete I decided to use taconite pellets, to tie the pieces together. Taconite pellets are probably sold in 100-ton lots, so it was somewhat difficult to find a few quarts of the stuff. Finally a gracious benefactor at a taconite-pellet company took pity on my pleas and sent me, gratis, a gallon of taconite pellets. Thanks! I still owe you some taconite-pellet art in return. 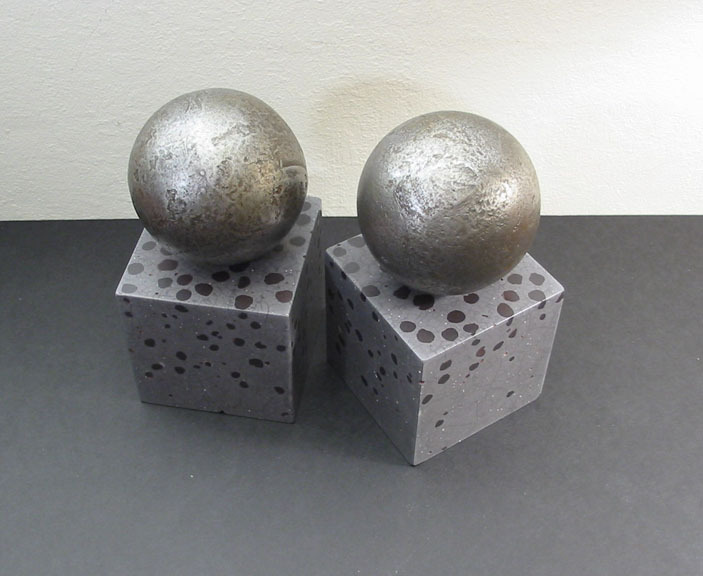 I chose to make the color of the concrete bases a gray that approximated the color of the steel balls. 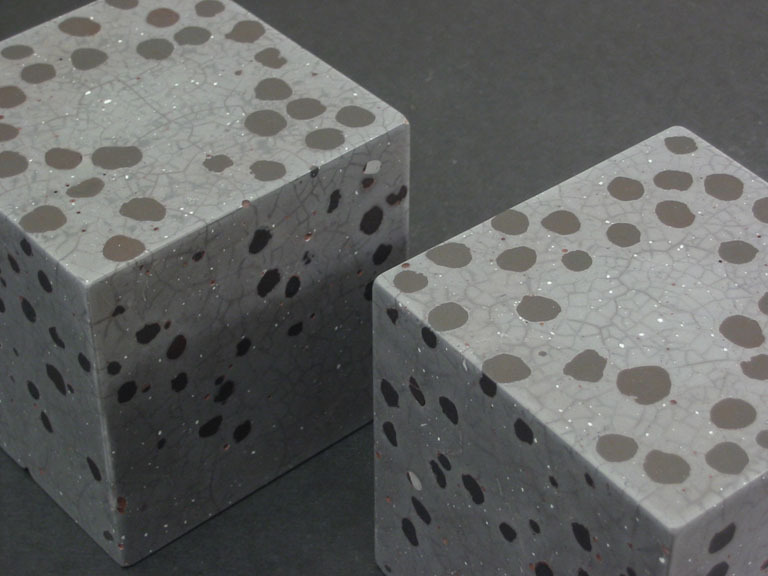 Fitting the theme, the colorant to achieve gray concrete is a black oxide of iron. 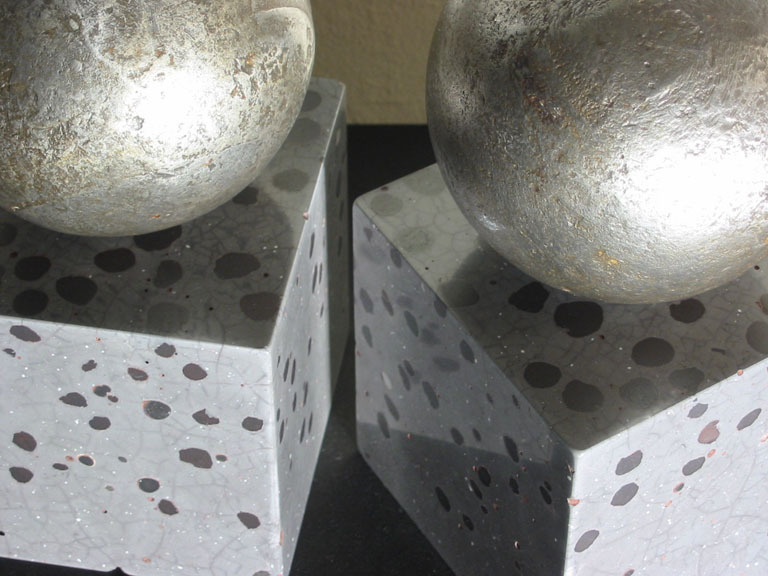 I wanted the balls to be removable from the concrete bases, so I chose to only encourage attachment by embedding a powerful neodymium rare-earth magnet near the top-center of each cube. I poured the concrete into forms and inserted wooden dowels from the top, which would become the bottom, reaching within a half-inch of the bottom, which would become the top. After the concrete set, I drilled out the wooden dowels, inserted a magnet into each cylindrical void, and then filled up the hole with more concrete. The magnets' presence is completely hidden visually. 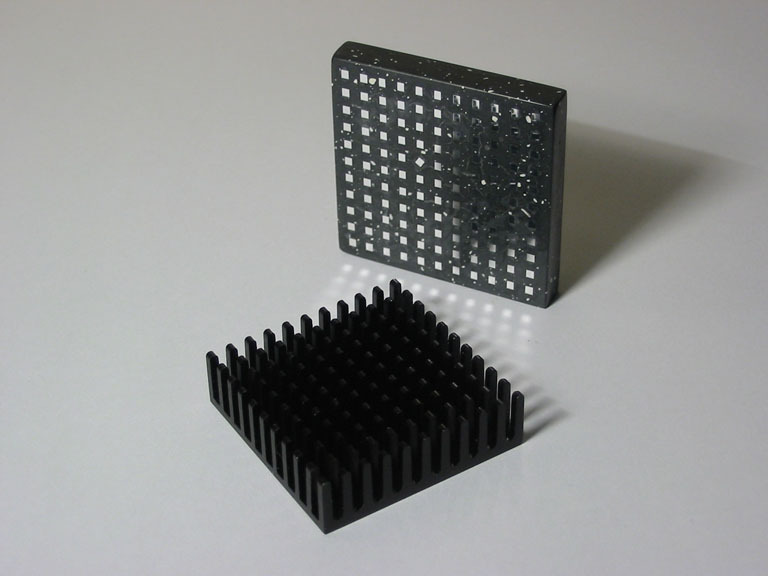 The magnets, due to their half-inch depth below the surface, are just barely strong enough to hold the balls in place. In fact, I don't even depend on them, because I soon learned that steel, especially steel that is slid about and spun around, is not kind to concrete. I added round rubber O-rings to hold the balls away from the polished bases. At least I know the magnets are in there. 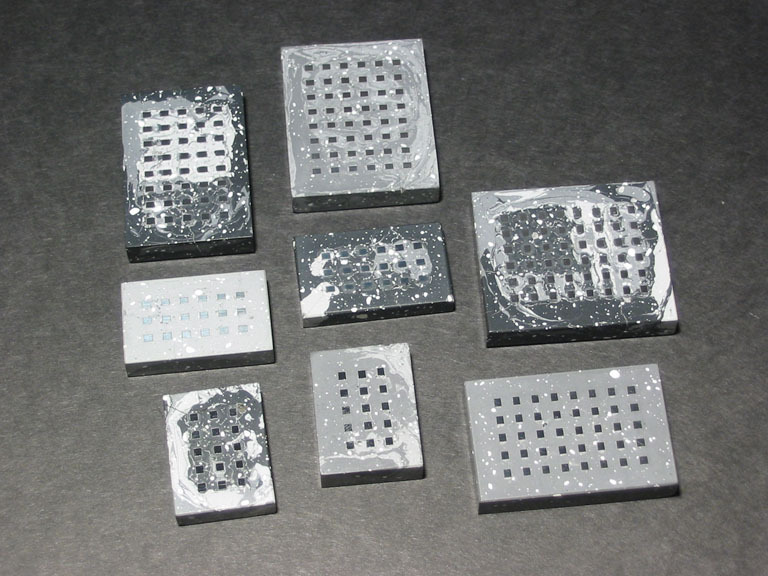 The bases were ground and polished to 6000-grit sandpaper. Due to their high iron content, the exposed taconite pellets have a curious dull metallic lustre. The attractive crazing on the surface of the cubes was a happy accident. I noticed it when the cubes were wet-sanded, but the effect vanished when they dried out. After experimenting, I found that a coat of mineral oil would keep the crazing visible. Concrete and aluminum. These are brooches, or pendants, or drawer pulls, or whatever use could be made of a small durable rectangle. The are made of colored concrete, sometimes several shades barely mixed together to emulate patterns in natural rock. Embedded in the concrete are pieces of surplus aluminum computer-processor heatsinks, square legs facing outward. When the concrete is ground away, an array of small, shiny metallic rectangles is revealed. Polished to 6000-grit sandpaper. Yes, you with the sharp eyes, on one there is a subtle, deliberately twisted heatsink leg, row 5, column 5, to commemorate May 5, a special day for me. Hardwood. I made my first lemming for a high-school assignment, of carved wax, in a primitive style. A decade later I simplified the design, removing the hint of feet, removing the ears and eyes, and executed many of them, in a smaller format, of birch wood. I did a third round when my supply began to run out, this time a touch larger, of exotic cocobolo wood. They are pleasant to observe, fun to touch, a good fit for the hand, and don't have that rodent smell. Oiled finish. My mother was an agate collector. I inherited her interest, and I inherited some of her agates. I didn't inherit her dedication to the art. It is hard work. 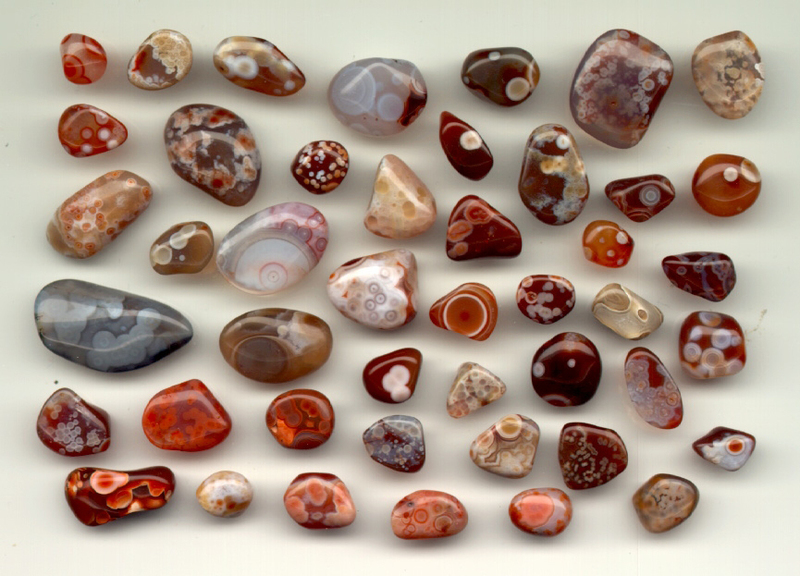 Below are a tiny sample of the rocks in her collection of Lake Superior agates. The largest is probably an inch across. 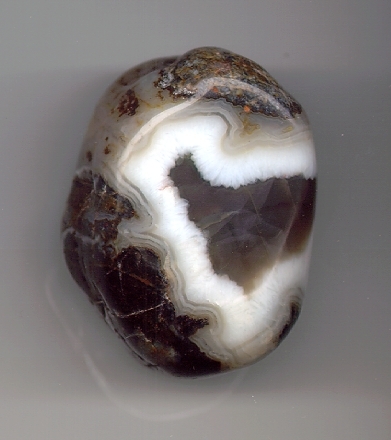 My own best find was this fist-sized black and white onyx. I found it in western Wisconsin. 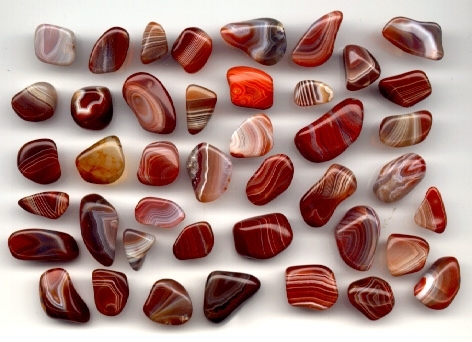 I was used to the reds and browns, from iron compounds, of Lake Superior agates. I had never seen black and white like this, before or after, in the areas where I hunted rocks. When I researched it, I learned that the closest source for onyx was in eastern Wisconsin. I don't know how this rock traveled across the state. Because it was precious to me, and I wanted to lose as little material as possible, I shaped it by hand, laboriously, and then gave it a quick polish in a rock tumbler. Acrylic. This shape fascinated me since I first saw it used in an illustration in a Scientific American article on 3-D computer imaging and the hidden-line problem. Many years later, when I happened to be in China, I saw an advertisement for Metalgesellschaft, a German company, that featured the shape, and explained its name, which reflects a similar shape used to lash timbers together in Chinese carpentry. I painted the figure as a isometric, axonometric, parallel projection, also known as Japanese perspective, and chose the colors to suggest the Japanese flag. Acrylic. It's all black. It's a little bit yellow. I like those colors. The background brush strokes are fabulously complex when they reflect light just right.